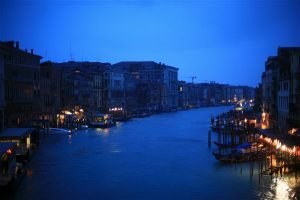 Venice is an island-city of Italy, located in the eastern Italy on the shores of Adriatic sea. The city is linked to mainland with a 4km long highway and railroad. It is situated on 118 small islands. 170 canal divides these islands and 400 bridges link them to each other. Venice is the only big town in Europe where land vehicles are not allowed to use. 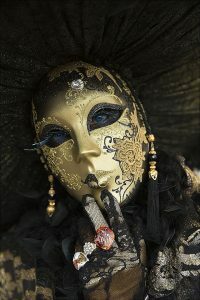 “City of Canals” ,“City of Masks”, “City of Waters”, “City of Bridges”, “Sinking City” are some of Venice’s nicknames. A lot to see and do in this city with many nicknames. 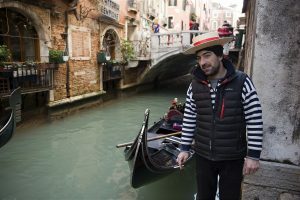 Visiting San Marco Square (Piazza San Marco), watching the town and taking pictures from Giotto’s Campanile (Campanile di San Marco), strolling around the Grand Canal, seeing Rialto bridge, touring with gondolas and buying a venice mask as a souvenir. 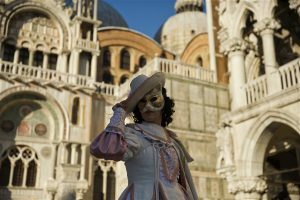 These should be the main points in your what to do in Venice list. San Marco Square is the worldwide famous square of Venice, where all streets and canals meet. 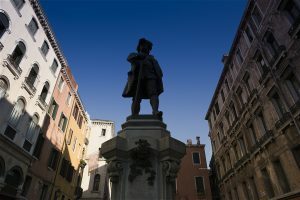 Some of the most significant buildings in the square are St Mark Basilica, which is built with the inspiration of Byzantine architecture, Doge’s Palace, St. Mark’s Clocktower, Giotto’s Campanile. The square is full of architectural structures with historical patterns, cafes where you can sit and relax, souvenir shops where you can buy beautiful souvenirs. 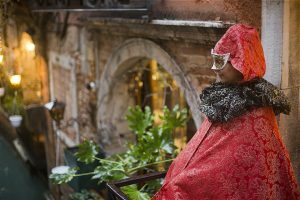 This is where you’ll visit a lot in Venice, it’s the heart of the city of Venice. 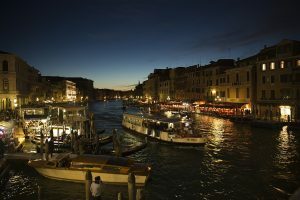 With the depth of 5 meters, Grand Canal lies across the whole Venice, from one side to another for 4 km, with the shape of reverse “S”. 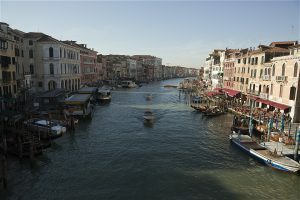 For a town like Venice, where the whole transportation is supplied by seaways, the canal can be called as main road. Also many sightworthy buildings are located on this canal. 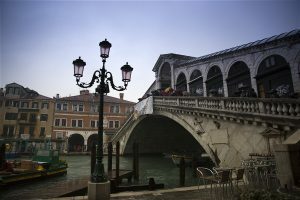 Four large bridges connects two sides of the Grand Canal. 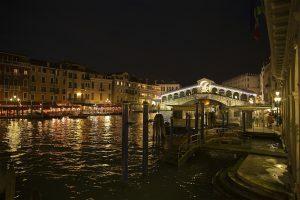 Most well known of those bridges, is Rialto Bridge. Built in 1591, collapsed in 1524, today we have the modernised version of the bridge which is exactly the same of the original wooden one. A good deal of souvenirs shops can be found on the bridge. 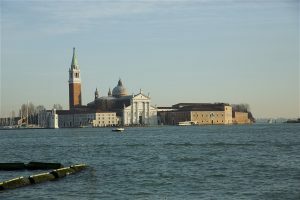 Santa Maria della Salute is a place to see with its grandness on Grand Canal. During 1600s, a plague caused a big proportion of the population to die, the basilica was built during this period and was dedicated to Mary. Both with its architecture style and the works of art it houses, it’s a notable place. 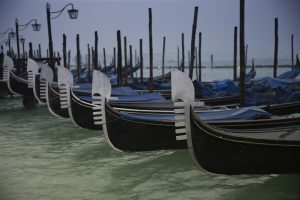 The city of Venice is always recalled with its gondolas. 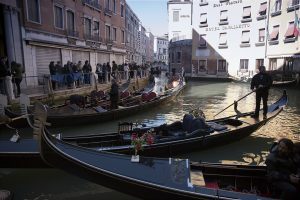 400 gondolas are spread all around the town. One and only transportation option of the past, is today functioning for a touristic activity and is preferred for canal tours. 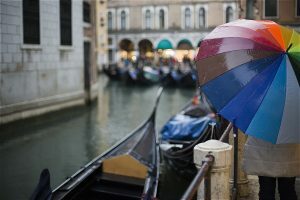 A pleasant tour on the canals with striped clothed gondoliers and musicians, will make you discover the side streets of Venice. Murano Island, which made a name for its glasswork starting in 10th century, was the place where glasswork for palaces and aristocrats’ houses done. You can still visit the remaining glass workshops, watch shows of glassblowing and join in workshops to create your own glassworks. Also you can buy beautiful souvenirs. Burano, which is another significant island, is famous for its lace-works. A school on this area was built on this island with colorful buildings row after row. Lace-work workshops are arranged in this island. 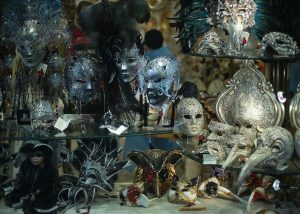 Every square, street in the town, almost like a theatre scene, behind the masks. It makes you feel like you’re in a time tunnel and visiting the unlike pages of the time. Sometimes, guests of palace’s ball in 13th century passes by you, and sometimes the princess of the stories smiles at you until you are surrounded by the aliens. This surprising journey of the pages of history does not require you to speak. 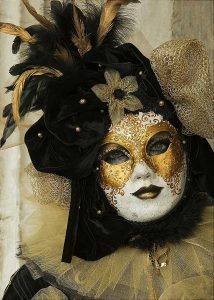 Only communication is the mysterious eyes and looks behind the masks. 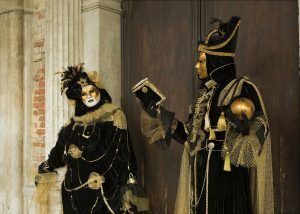 In every hour of the day, people with masks and costumes wander around. 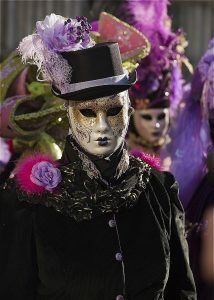 Especially, as the sun starts to lighten the town, it makes you feel like being in a exciting movie, to see the people with masks wander. 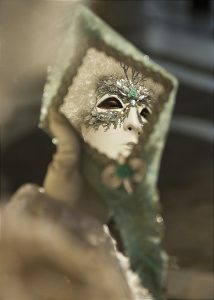 And the lives hiding behind the masks, for quite a while, makes you forget about the sadness of life. 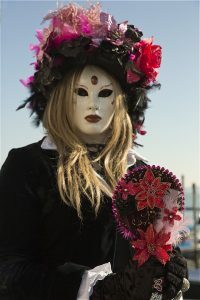 Participants of the fest, usually forget about themselves, thanks to their costumes and masks. Sometimes with hand gestures or mimics, they reveal this frame of mind. 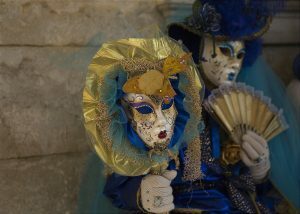 The Carnival starts in February 2, ends in Tuesday of Forgiveness, when the sins are forgiven. 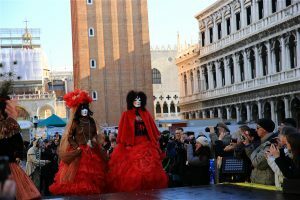 Also in St. Stephen’s Day in December 26 and during the Ascension of Jesus and also in October 5 until the christmas, masks are the main entertaintment in Venice. 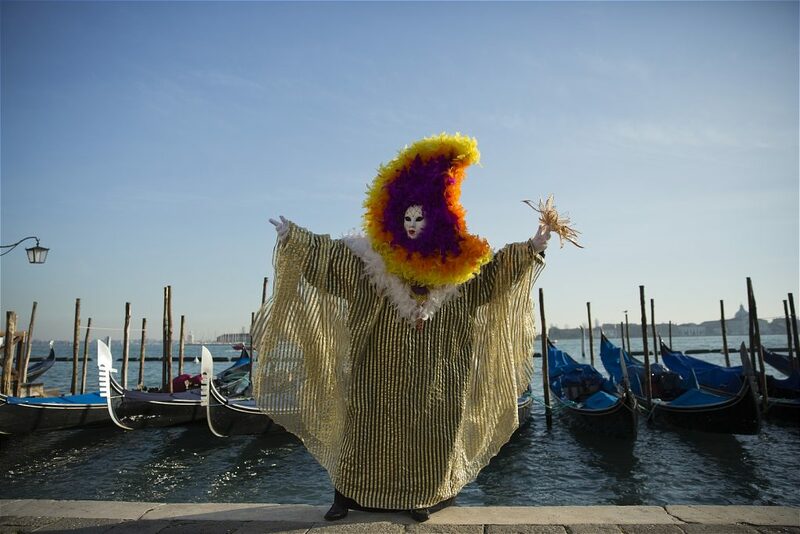 Celebrated since 1268, the carnival actually based on the welcoming spring in pagan culture. 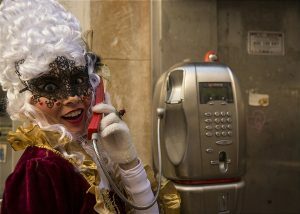 Being banned from time to time in history, the carnival has been celebrated every year since 1979. 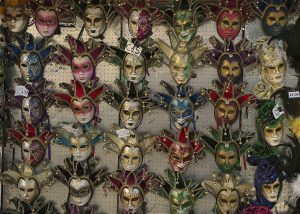 During the earliest days the masks functioned as a device to avoid class antagonism. 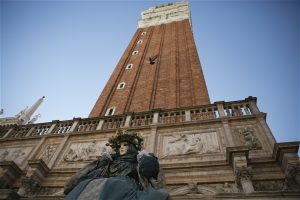 Today they are the irreplaceable elements of Venice carnival. 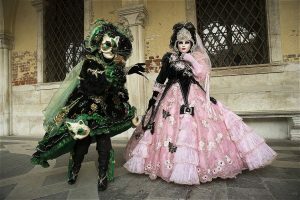 There are many myths about why and how did Venice Carnival started with a history until 13th century. 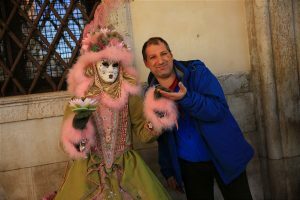 One of the most popular and most believed one is that when a victory of Venice happened in 1162, the people of Venice started to dance in St. Mark Square and it became a tradition. An offical fest since 1979, it’s celebrated every year in February. 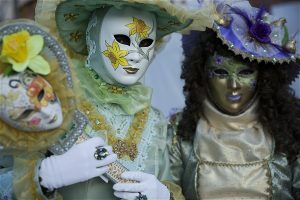 Most characteristic element of the carnival, masks are there to emphasise the equality and respond to class discriminations of the old times. 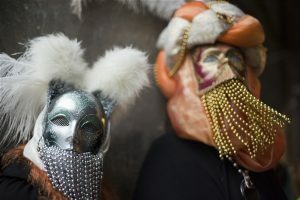 Also this masks makes it easier to understand that the carnival’s spirit bears an idea of being against the rules and liberty. 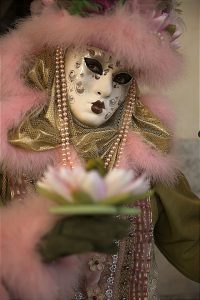 Masks are prepared every year to fit the theme of the year arranged by fest committee. All across the town, events and activities are arranged on this certain theme. 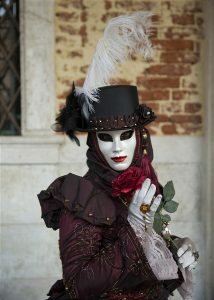 Wearing masks are not obligatory, but the people of Venice are attentive. 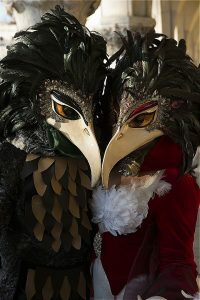 It can be said that this is because of their belief that the masks demolish class differences. 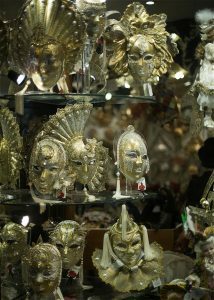 Already a beautiful city, Venice gives reasons to a million photos with thousand of masks and gorgeous crowds. 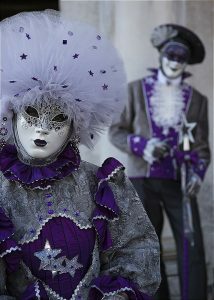 Masks are always the central points of attraction of Venice Carnival. 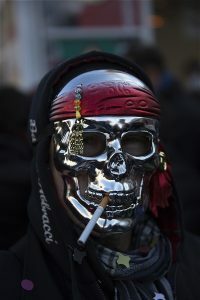 In old days functionality was the main part, but today the designer masks are usually preferred. BAUTA, covers the whole face and doesn’t have holes even for the mouth. In the past, Bauta were wore by criminals, sick people with scars on their faces and people who want to hide from the society. There are also Bautas which masks the parts of face, from forehead to nose. This masks were not often preferred as it didn’t conceal the identities good enough. Today this kind of Bautas are more usual as they give space to breath and eat. 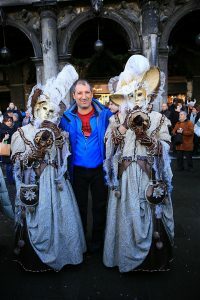 Bautas are the most popular masks of the carnival. MORETTA, are oval formed, covered with black velvet. First used in France, Morettas later spread into Venice. They are usually decorated with tules and preferred mostly by the women. These masks cover the face excluding the lips and area around. LARVA, are lighter masks as they are made of wax and cloth. 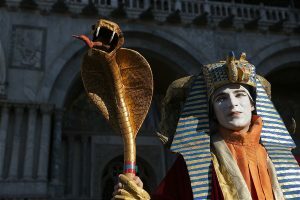 Its form makes it possible to eat and drink without taking off the mask. 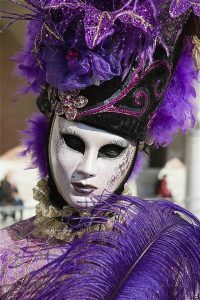 They are one of the most popular masks as they can be wore for long whiles. Larvas are usually white and includes some decorations. 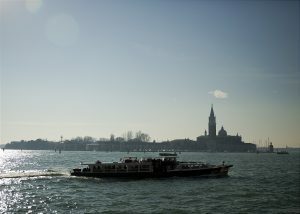 Known as Volto, some larvas are the first thing to come into mind about Venice. These masks are completed with a cloak and hats called tricorn. 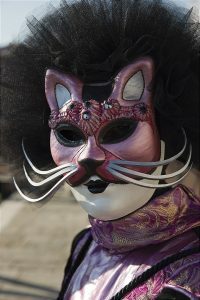 Those who wish to get a simpler mask get cat masks only covering the eyes and decorated with feather. 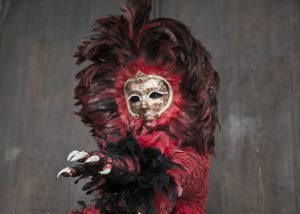 Considered as the most important part of the carnival, the best mask is chosen by a design jury. To get this prestigious prize, best designers are working through the all year.